This is the best kind of healthy recipe makeover: the kind no one will notice. Believe us when we say this dish is one of the best meals we've ever eaten. This is the best kind of healthy recipe makeover: the kind no one will notice. Believe us when we say this dish is one of the best meals we've ever eaten. Like this recipe? Then you'll love "The SparkPeople Cookbook: Love Your Food, Lose the Weight." Click here for more info. Grits are traditionally made with cream and butter, but I swapped in low-fat evaporated milk. To keep that rich cheese flavor without adding loads of fat, I used a flavorful, full-fat cheese. A little sharp Cheddar goes a long way. For the shrimp, I used tomato paste to add depth, then included four different vegetables to boost the nutrition. Fill a saucepan with 2 1/4 cups of water and the salt. Bring to a boil, then slowly whisk in the grits. Cover and simmer over low heat for 12 minutes, stirring often. Add the remaining ingredients and stir to combine. Remove from heat. The grits will thicken as they sit, so you may need to add an additional 1/4 to 1/2 cup of water just before serving. The grits should be pourable. Place a large sautepan over moderate heat. Heat the oil then add the onions, sauteing for 3 minutes. Add the garlic and peppers, cooking another 3 minutes. Add the corn and the flour, stirring constantly for 1 minute to cook the flour. Add the tomato paste and the shrimp, cooking for five minutes, or until the shrimp turns pink. Slowly add one cup of water to the saucepan, stirring and scraping to reincorporate any crust that's on the bottom of the pan. Simmer for 5-8 minutes. Add the tomatoes, heat through, and remove from heat. 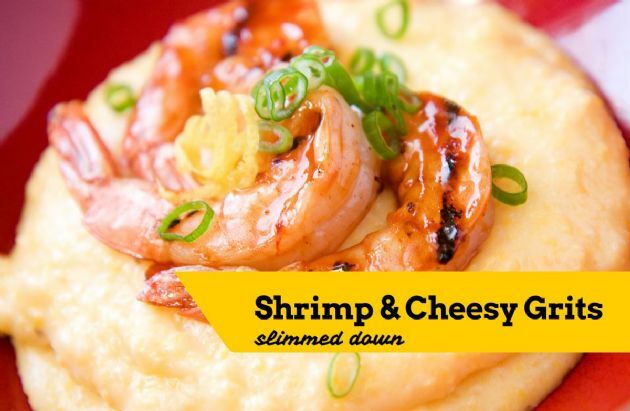 Place 3/4 cup warm grits into a soup bowl, and top with one cup of the shrimp and vegetables. Sprinkle on one tablespoon of chopped green onions before serving.